I discovered the coolest piece of furniture, Baby Bunk, that was designed by a mother and built by a father to help you co-sleep safely and comfortably. 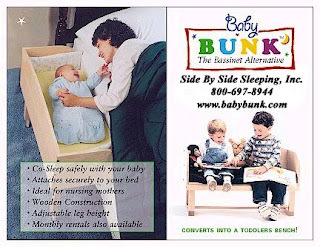 Baby Bunk is a family owned and operated business that really understands their customers needs since they used the Baby Bunk for all four of their children. I co-slept with both of my babies and I can tell you I would love to have had a Baby Bunk! It would have saved my neck and shoulders and made me so much more comfortable! I always slept with my arm up over my babies head and around them because I wanted them to be close to me and I wanted to make sure that my husband did roll over on them. I could never put them on the outside of the bed for fear they might fall off. I remember many nights marveling at how as a mother you just get used to doing uncomfortable things to keep your babies safe and happy. I guess I didn’t have to, if I had only known about the Baby Bunk. If we have another child, we’ll be getting a Baby Bunk because I want to co-sleep safely and comfortably this time. The idea behind the Baby Bunk is that it attaches securely to your bed, allowing you to co-sleep safely with your baby, but still giving each of you your own sleeping space. The Baby BunkTM sleeper will allow you to nurse and respond to your baby’s needs at night without leaving your bed. Lactation specialists highly recommend, especially for Moms returning to work, co-sleeping to help form a better bond between mother and baby. Co-sleeping is also great for Moms who are recovering from Caesarean section to help both of you co-sleep safely and prevent mom from having to get up and down. The Baby Bunk is also very practical because it can convert to a toddler bench! Baby Bunk Infant Sleepers are made from solid maple and are finished with a clear, water based lacquer. Baby Bunk also has an array of accessories available to use in conjunction with the Baby Bunk ranging from standard mattresses and bedding to organic mattress and bedding. 1. Notre Dame anthropology professor and leading sleep researcher, James McKenna, has long held that babies who sleep with their mothers enjoy greater immunilogical benefits from breastfeeding because they nurse twice as frequently as their counterparts who sleep alone. 2. In his book on Sudden Infant Death Syndrome, pediatrician William Sears cites co-sleeping as a proactive measure parents can take to reduce the risk of this tragedy. McKenna’s research shows that babies who sleep with parents spend less time in Level III sleep, a state of deep sleep when the risk of apneas are increased. Further, co-sleeping babies learn to imitate healthy breathing patterns from their bunkmates. 3. Co-Sleeping Babies Sleep Better. Sleepsharing babies usually go to sleep and stay asleep better. 4. Co-Sleeping Mothers Sleep Better. Many mothers and infants are able to achieve nighttime harmony: babies and mothers get their sleep cycles in sync with one another. 5. Breastfeeding Is Easier When Co-Sleeping. Most veteran breastfeeding mothers have, for survival, learned that sharing sleep makes breastfeeding easier. I loved not having to get up to go feed my babies! 6. Co-Sleeping is Contemporary Parenting. Sleepsharing is even more relevant in today’s busy lifestyles. As more and more mothers, out of necessity, are separated from their baby during the day, sleeping with their baby at night allows them to reconnect and make up for missed touch time during the day. Learn more about how you can co-sleep safely and comfortably and check out Baby Bunk now to learn more!